Arnis, also known as kali, escrima, baston, etc., is the best known and the most systematic fighting art in the Philippines. This pre-Hispanic martial art was the brawny and bloody power of the early Filipinos in the protection and preservation of their dignity and honor. It is a complete martial art system, encompassing weapons training and empty-hand self-defense. It includes training in single stick techniques (solo baston), double stick techniques (doble baston), stick and knife or dagger techniques (espada y daga) and knife techniques (daga). Some styles may include staff and spear (sibat) training in their curriculum. Others will include the practice of medium to long bladed weapons (bolo) in their repertoire. Many styles have some form of empty hand combat, encompassing striking, kicking, locking, throwing and even choking methods. These are usually taught when the practitioner has demonstrated a reasonable degree of proficiency with the weapons of this style of arnis. Different arnis styles, from different parts of the country, may emphasize different areas of the training methods noted above. The Filipino martial arts assume different names in different regions. In the Tagalog region, the art is known as Arnis or Pananandata, in Pangasinan as Kalirongan, in the Ilocos region of Luzon as Kabaro-an, and in the Visayas as Eskrima. Arnis historians have cited as many as 200 systems or styles of Arnis-Eskrima-Kali. Names describing the range of fighting include Largo (long-distance), Medio (medium-range) and Corto or Serrada (close, in-fighting). Names based on movement include Abanyko (fanning), Palis-Palis (go with the force) Sungkiti (flicking), Ocho-Ocho (figure eight) and Lastico (snapping). Systems can be called by the choice of weapon, e.g., solo baston (single cane), doble baston or sinawali (double cane), espada y daga (sword and dagger), mano-mano or de kadena (empty-hands). The term arnis is believed to be a Tagalog corruption of the Spanish term arnes, or harness, a reference to the decorations worn by the early Filipinos. Kali is another term used to refer to the same kind of martial arts. Different provinces may have different names for arnis, such as baston and kaliradman (Ilonggo, Bisaya), pagkalikali (Ibanag) and kalirongan (Pangasinan). These are only a few examples of the terms already recorded in different sources. One suggestion is that it originally came from another martial art system, called tjakalele. This is actually the name of a branch of the Indonesian martial art system known as pentjak silat. Another suggestion is that it was brought here from the Southeast Asian mainland, particularly during the Madjapahit and Shri-Visayan empires. Yet another suggestion is that it was propagated by the so-called ten Bornean datus fleeing persecution from their homeland. The glorious lives of Filipino heroes are linked with the awesome power of the martial art of Arnis. They triumphantly waged their heroic battles for freedom and liberty as a testimony of the power and effectiveness of Arnis. Their successful stand against their superiorly armed adversaries in mortal combat in the arena of battle is now held in immortal inviolability by history. It would not be far-fetched to surmise that one of the earliest Filipino heroes, Lapu-lapu, was a kali (Arnis) expert. 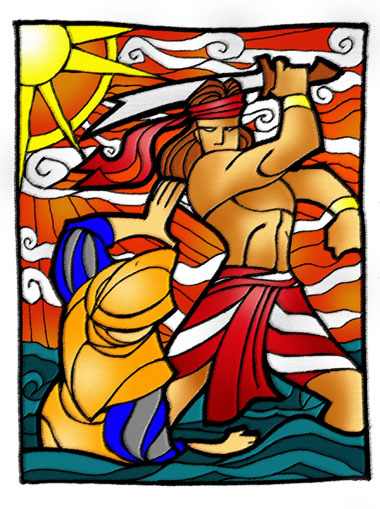 Pigafetta, Magellan's chronicler and historian, recorded that on April 27, 1521, Lapu-lapu felled the great Spanish warrior with a bladed weapon thus marking a Filipino's first victorious stand against a foreign invader. Pigafetta also recorded that many of the natives carried a pointed a short hardwood stick which had been further hardened by fire treatment and used in fighting. This stick may have been the forerunner of the present muton or baston in Arnis. During Spanish 400 year of occupation of the Philippines, Spanish fencing also had a direct effect on the fighting arts of the Philippines, with the introduction of angles of attack, and the use of Espada y daga (sword and dagger). When the Spanish imposed a ban on the practice of all native fighting arts and the carrying of bladed weapons during their occupation of the islands, the Filipinos were forced to substitute the use of the sword with that of the rattan. In the beginning the rattan was used to deliver strikes in the same manner as the blade i.e. slashing and thrusting, and the knife (or short stick) was still held in reserve as a back up weapon in case the opponent closed the distance, typical of it's use by the Spanish. Hardly ever was it used to block or parry an oncoming strike. However through time the Filipinos began to realise that because the stick had different handling qualities, certain lines of attack were open to them that were not available with the sword e.g. curved and snapping strikes. Once they began to appreciate the combat effectiveness of the stick the use of the knife also changed and began to be used more aggressively in terms of blocking, parrying, checking, scooping, thrusting and slashing. This in turn led to the creation of Olisi y baraw (stick and dagger). During the war with Spain, the Philippine Fighters employ some techniques from the Spanish Weapon Fighting (Espada y Daga), which refer to a "Sword with a Knife". Later on, the art "Kali" evolved to some other names like Arnis de Mano, Kalis de Mano, and Dos Manos.